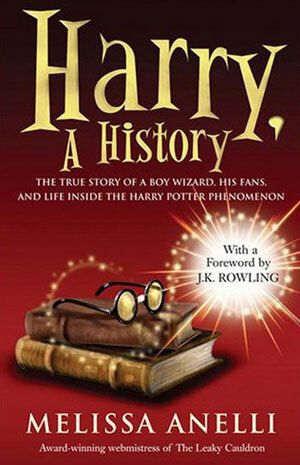 Harry, A History is a New York Times bestselling book about the Harry Potter phenomenon. It has been published in the US (S&S Pocket), Canada (S&S Pocket), the UK (S&S Pocket) and Australia (Penguin) and is currently slated for translation in Germany (edelkids, May 2009) and Norway. It features exclusive interview material with key figures involved in the publication and production of the Potter books and films, as well as a foreword written by Harry Potter author J.K. Rowling. "In her vivid and illuminating book, Anelli unravels what lies beneath the Harry Potter phenomenon and how it feels to be so wrapped up in the mystical world. Crammed with details and facts, this is a heartfelt, well-written book by a true insider. Here is the North American cover and blurb! And as webmistress of the Leaky Cauldron, one of the most popular Harry Potter sites on the Internet, Melissa Anelli had a front row seat to it all. Whether it was helping Scholastic stop leaks and track down counterfeiters, hosting live PotterCasts at bookstores across the country, touring with the wizard rock band Harry and the Potters, or traveling to Edinburgh to interview J.K. Rowling personally, Melissa was at the center of the Harry Potter tornado, and nothing about her life would ever be the same. The Harry Potter books are a triumph of the imagination that did far more than break sales records for all time. They restored the world's sense of wonder and took on a magical life of their own. Now the series has ended, but the story is not over. With remembrances from J.K. Rowling's editors, agents, publicists, fans, and Rowling herself, Melissa Anelli takes us on a personal journey through every aspect of the Harry Potter phenomenon -- from his very first spell to his lasting impact on the way we live and dream. Melissa Anelli can truly say that Harry Potter changed her life. An unemployed graduate when she first fell under the boy wizard's spell, her growing passion for the books opened the door to a career which must surely be the envy of every Potter fan, giving her privileged access not only to J.K. Rowling but to all the VIPs of the Potterverse. 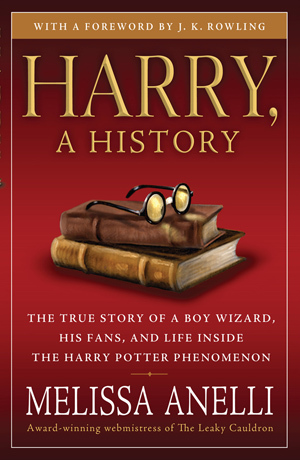 Now, looking back in the aftermath of the seventh and final instalment of the saga, Harry: A History is both a thoroughly entertaining study of the global impact Potter has had on popular culture, and an engaging personal account of Melissa's own journey as a fan. As well as knowing everyone who is anyone in the world of Harry Potter -- from the agent who first took a leap of faith in an unknown chidren's author to the stars, big and small, of the Harry Potter films -- Melissa is ideally placed to write about how it feels to be enraptured by an invented world. Anyone with the least interest in how Harry Potter became the cultural phenomenon of its time will welcome her insights into its rise and rise; while Potter fans will love her book -- because she is one of them. Dieses Buch zu lesen, war eine unglaubliche Erfahrung für mich. Es war, als hätte ich endlich erreicht, was ich mir seit Jahren gewünscht hatte: Unerkannt und unentdeckt zu einer Harry Potter-Veröffentlichung um Mitternacht in einen Buchladen zu gehen und einfach nur zuzusehen und zuzuhören (J.K. Rowling)Die Bücher waren nur der Anfang und doch sind sie das Herz von Harry Potter. Die Romane sind in 67 Sprachen übersetzt worden. Weltweit wurden mehr als 400 Millionen Exemplare verkauft. Harry Potter ein Phänomen. Die Serie ist abgeschlossen, die Geschichte nicht vorbei. Ob im Gespräch mit J. K. Rowlings Lektoren, ihrem Agenten Christopher Little, Verlegern oder der Autorin selbst Melissa Anelli nimmt uns mit auf eine ganz persönliche Reise durch Harrys Welt: von seinem ersten Zauberspruch bis hin zu dem bleibenden. Einfluss, den er auf das Leben und die Träume seiner Fans hat. Coming soon: info on the Australian, German and Norwegian editions, and any more that come along! © Melissa Anelli, 2008-2010. All rights reserved. 7:30 pm, Speech, Q&A and signing, free! 7 pm, Speech, Q&A and signing, free! More event info on the way! For contact info or to find out how to book an event, please click here.